Secondly: Do not forget to join in the Tolkien birthday toast. You do this by having a glass (or cup, goblet, mug or whatever container) of your preferred drink (alcoholic or not as you prefer), and at 9 PM (21:00) local time on Friday, January 3rd (that is, today by Danish time), you stand up, raise the container, say the toast: ‘The Professor!’ and take a sip or swig of the drink. See also http://tolkiensociety.org/toast/2014/ where you can also enter your personal greeting to Tolkien enthusiasts all over the world. As is probably well-known by everyone reading this, December has seem the release of the second installment of Peter Jackson's film trilogy based on Tolkien's story, The Hobbit. Whatever one's feeling's about it, I dare say it has been ‘expected’ (though I suspect with emotions spanning the whole range from the blackest dread and despair to the most deleriously happy expecations). I am going to ignore the film here — in part because I have no intention of further fuelling the divisive debates among otherwise friendly Tolkien enthusiasts, and partly because I do not really find it terribly interesting to discuss whether Peter Jackson is a blasphemer or a brilliant artist ... or perhaps both. So, this month all the usual disclaimers — about newness, completeness and relevance (or any other implication of responsibility) — appear even more relevant than usual. Right ... so ... apart from the inappropriateness of the use of ‘precious’ in this context, this story has still received far too much attention, giving the impression that modern journalists do indeed love the arrow for its swiftness and not least the gun for its loudness. Still, there are few interesting biographical details surrounding this. One of a huge number of news outlets carrying the news that a film about the life of Tolkien is being planned. While I would agree with Tolkien Society chairman Shaun Gunner that Tolkien ‘is an incredibly intersting person,’ I cannot agree that he would make a good character for a film — films are rather poor as the means of conveying erudition and philosophical depth, and these are what makes Tolkien's life interesting. That scientists are often Tolkien fans shows in many ways small and large. The nicknaming of the Homo Floresiensis as ‘The Hobbit’ is a well-known example, and in The Science of Middle-earth Henry Gee lists numerous other examples of Tolkien-inspired scientific names. Had Henry Gee attempted to make an exhaustive list, he would have set himself an impossible task as that list would have to be updated regularly — as is evidenced by this short piece of news about the naming of new-found species of small wasps. Being an ‘exclusive interview with builders Alice Finch & David Frank’ who have done a very nice recreation of Rivendell (though I'm not sure which, if any, visualisation of Rivendell this is based on, but it is definitely not Tolkien's). All in the spirit of good fun — I suppose that the medical science is solid, though of course this reverses cause and effect within the narrative. Right ... so ... no rule without exceptions, and the exception here is Holly Rodgers' tale of how she took her group of Dwarves (or most of them, anyway) to the cinema to watch the latest work by Peter Jackson. It raises, of course, the question of magic as a source of energy — is this the long sought-for _perpetuum mobile_? ‘Doing a PhD in Middle-earth’ (10 Dec) — a rather clever (and humorous) reading of The Hobbit as an allegory of the process of doing a Ph.D.
‘Tolkien's The Hobbit: Bilbo’s Quest for Identity and Maturity’ () — being a bachelor's thesis from the Czech Republic investigating in three chapters ‘Tolkien and Fantasy’, ‘Bilbo's Quest for Identity’ and ‘Aspects of the Popularity’ of Tolkien's book. ‘Theoderic the Great vs. Boethius: Tensions in Italy in the Late 5th and Early 6th Centuries’ (28 Dec) — Boëthius, and particularly the work of his imprisonment, The Consolation of Philosophy, has often been mentioned with respect to Tolkien as a source for certain philosophical aspects of Tolkien's work. Here is a paper giving some additional context to the circumstances in which Boëthius' book came to be. Morgan Thomsen has uncovered a very interesting little piece of information about Tolkien's movements about the time when he renewed contact with Edith Bratt after he had himself turned 21. This includes where he stayed and the precise dates of his stays, but do read the story for yourself at the Mythoi blog and in the relevant books (mainly The J.R.R. Tolkien Companion and Guide by Christina Scull and Wayne Hammond; Tolkien and the Great War by John Garth, and of course Tolkien: A Biography by Humphrey Carpenter). I am afraid that the serious science of this paper has been overlooked by many commenters, who have merely found it amusing. The serious science is of course in the advances in climate science and computing capabilities — based on Tolkien's maps and a few other bits of information, the climate models have been capable of predicting the climate of Middle-earth. It is, at least for me, impressive that Tolkien has, working solely on some deep intuition, been able to place the Shire such that it would have the climate of the English Midlands (though Leistershire and Lincolnshire that are mentioned here are counted to the East Midlands rather than Tolkien's West Midlands). I'll forgo mentioning further articles on this — searching Google News for ‘Tolkien Middle-earth weather climate Bristol’ will return numerous results, few of which have anything significant to add to the press release from The University of Bristol above. In this essay Simon Cook revisits some of the ideas he shared in the essay published in August, but this time round he wishes to address the topic differently, continuing his research, while at the same time wishing to ‘tidy things up’ — even to the point of saying that ‘some of [his] earlier concluding suggestions [...] now seem distinctly dubious.’ In this essay Simon Cook certainly avoids the traps that gave me misgivings in August. He starts by giving a short summary of the evolution of the relations of language/philology and race to the central concept of (national) identity, and then progresses to find parallels between ideas about the otherwise unknown neolithic aborigines of Britain and Tolkien's Hobbits. It will be interesting to see where he will eventually take these emerging ideas. The fascinating history of Tolkien's relation with tape recorders. Read and enjoy! The title says it, I think :) Personally I have not yet found the key that will unlock for me the fascination of Pauline Baynes' illustrations, but looking at them, I can at least feel that such a key must exist ... But whether you have already found your own key to Baynes' work or you, like me, is still searching, this loving introduction by John Garth to this famous illustrator of Tolkien and others is well worth reading. An intelligent recapitulation of dragon lore — I just wish that he had found room also for Fafnír, for as Tolkien said, ‘the world that contained even the imagination of Fáfnir was richer and more beautiful, at whatever cost of peril.’ (from the essay ‘On Fairy-stories’). One of these articles that are well-meant, and which gets almost all its facts correct. Tolkien, for instance, says in ‘On Fairy-stories’ that he didn't particularly like fairy-stories as a child; after his mother's death, he and his brother Hilary didn't pass into the care of relatives, but into the care of Fr. Francis of the Birmingham Oratory, he held a position at the University of Leeds between the short stint at the New English Dictionary and the position as Rawlinson and Bosworth Professor of Anglo-Saxon at Oxford University (in which position he was, a year after his appointment, made a fellow of Pembroke). I could continue, but I suppose this suffices to show that one has to be careful about trusting information in such articles no matter how well-meant and how favourably they describe Tolkien's work. An interesting commentary on Tolkien, taking at its focusing lens the commentary by China Miéville on Jackson and Tolkien. ‘when I need to figure out the hard times, Sam Gamgee and Frodo offer more wisdom than Power understands.’ Brilliant! About Tolkien's use of the Eagles, with some speculation on how to fill some of the gaps in our knowledge. Not so much about Tolkien, actually — more about Alslabie Denham, the author of the Denham Tracts where the word ‘hobbit’ first appears in print. Still, the Denham Tracts are an important piece of the linguistic puzzle surrounding that famous first line of Tolkien's children's book. The proceedings of the homonymous conference held last year in September, this has papers from speakers such as Flieger, Shippey, Drout, Honegger, Milbank, Fimi and others. I haven't had time to read it myself, but I look forward to getting into it. So, now we are to believe that Abyssinia is an important source to _The Lord of the Rings_? I suppose that one shouldn't reject ideas before at least investigating them, but starting with random phonetic and/or spelling similarities is a good way to get me in my most sceptical mode. “It is hard to express the disgust [Tolkien] must have felt at the old, pre-philological habit of snatching at coincidental similarities” writes Tolkien scholar par excellance, Tom Shippey, in his contribution to Jason Fisher's collection Tolkien and the Study of His Sources: Critical Essays, and in Pieter Collier's very favourable review, “snatching at coincidental similarities” seems to be precisely where Mr Muhling starts of. For myself, I think I will wait to see what reviews this book gets elsewhere — though it is off to a bad start, the final scholarship can, of course, be excellent. A review of Snyder's book. Gilsdorf (I find that I am always more inclined to listen to the voice of someone who can spell ‘Middle-earth’ correctly) says that the book ‘as a beginner’s guide, ‘The Making of Middle-earth’ adds an important voice to the growing body of Tolkien scholarship for laypeople.’ With the very accessible scholarly works of Wayne Hammond and Christina Scull; Tom Shippey; John Garth and others at our fingertips, I am, however, not sure that what we need is a beginner's guide to Tolkien. On the date of the destruction of the Master Ring, Oloris Publishing will release Anglo-Saxon Community in J.R.R. Tolkien's ‘The Lord of the Rings' about Anglo-Saxon culture and it's 'reinvention’ in Rohan. 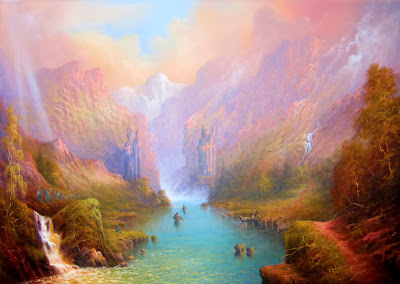 While I suppose it may be debated whether Barbara Remington's cover art for the original Ballantine PB editions of The Lord of the Rings can really count as Tolkienian artwork (I seem to remember that she had not had time to even read the books when doing the covers), there is really no denying that it is in many ways iconic. Click the link in the bottom for the E-bay auction with a letter from Betty Ballantine telling some of the story of this piece of book-cover-art. A very nice landscape picture from Joe Gilronan -- congratulations! 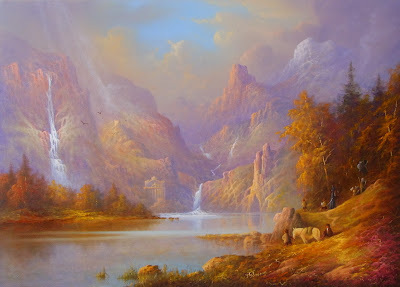 A brief report from the art show ‘out of the Shire’ (in the Nucleus gallery in Alhambra, California) featuring art in tribute to Tolkien by more than 30 artists. Evidently not all of it is a direct artistic interpretation of Tolkien's work, but is still somehow related. What a load of tosh! I don't know which so-called ‘Tolkien scholars’ Mr Lebovic refers to, but they are certainly not reputable Tolkien scholars. I speculated whether to include this item at all since I will not be able to provide a refutation of all that is wrong (I would recommend people to start out by reading up on the dwarfs of the Old Norse legends and myths and attribute anything possible to that source for a start), but sometimes it is better to acknowledge the existing while crying to the world, ‘Wrong! Wrong! Wrong!’ I just hope that this is one of those instances. A new blog (see under sources). Contents from these blogs will only be reported here if there is something that I find particularly interesting, or posts that fit with a monthly theme, but I will here note the number of Tolkien-related posts in the month covered by these transactions (while the number of posts with a vaguer relation — e.g. by being about other Inklings — are given in parentheses). The two Tolkien-related posts by Christina Scull and Wayne Hammond in December 2013 have been referred to above. 8 directly, and 9 indirectly Tolkien-related posts in December 2013. The directly related include, in addition to the articles cited above, suggestions for Christmas presents for Tolkienists, new high-quality editions of Unfinished Tales and The Fall of Arthur, the sale of a copy of the New Testament (Westminster Version) owned and commented by Tolkien, and the selling of prints of Cor Blok art. In December 2013, John Rateliff has posted a couple of Tolkien-related items (one about one of Tolkien's desks, and the other about Tolkien references in a Stephen King), a couple of posts about Lewis, one about the rumours of an upcoming Tolkien biopic and some four or five posts about the latest work of Peter Jackson. Five posts relating to Peter Jackson's latest from The Tolkienist in December 2013. No Tolkien-related posts in December 2013, but Jenny Dolfen has pursued her interest in Hannibal with a couple of posts with very nice new work. 8 Tolkien-related posts in December 2013 and two related to the latest from Peter Jackson. Nothing directly related to Tolkien, but a review of the latest work by Peter Jackson (they seem to be quite the vogue), another post about Charles Williams, and a post about a fan-fiction based on the Notion Club Papers. A new Tolkien-related blog. The first post (‘Who is the Real LOTR?’) sets out the agenda for The Real LotR — an attempt ‘to bring back authentic dialogue and discussion to [Tolkien's] work.’ Here, from a blog dedicated to the ‘Enquiry into the Books’ I wish The Real LotR all the best in that endeavour! "A review of Peter Jackson's latest is the closest thing to a Tolkien-related post from David Bratman in December 2013." Didn't my obituary for Colin Wilson count? I am very sorry! I both forgot and overlooked that when doing the summary – I have amended the post. Thank your for the reminder!